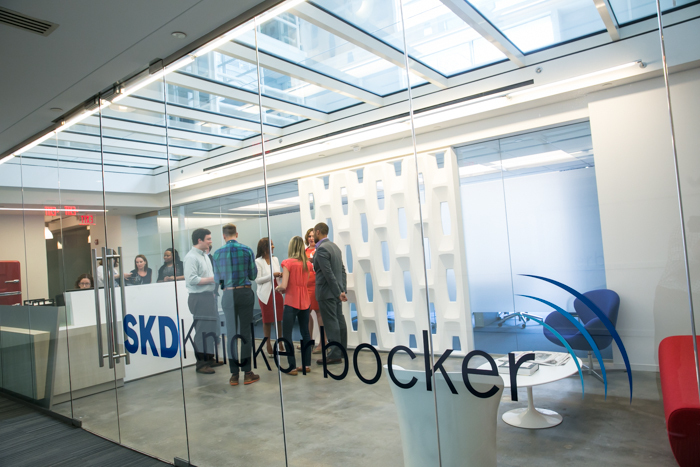 SKDKnickerbocker has announced that former director of paid media at Hillary Clinton for America and director of independent expenditure at the Democratic Governors Association Oren Shur has joined as senior vice president and political director. Shur has worked in several competitive campaigns over the past decade and a half, including Hillary for America, the Democratic Governors Association, and campaign manager for the re-election of Go. Jay Nixon (D-MO) in 2012. 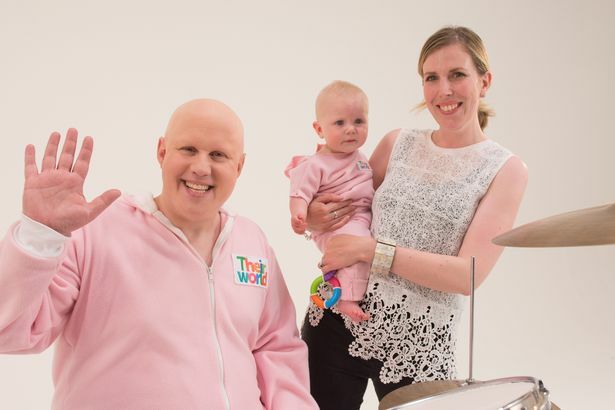 British Comedian Matt Lucas dressed in a baby onesie to raise awareness of five crucial interventions needed for children under 5 years old. Promoting the #5for5 campaign sponsored by the children’s charity Theirworld, Lucas returned to his Shooting Stars character George Dawes to draw attention to the five most crucial things infants and toddlers under the age of five years old need to thrive. “I think 5 for 5 is a great campaign to be involved in, it’s a strong message. Theirworld is a great charity. For me, it was a good opportunity to be George Dawes again because I haven’t been George for eight years!” commented Lucas. The comedian and actor is renowned for his work on the shows Little Britain and Dr. Who, and is the first of several comedians around the globe starring in short films to promote the #5for5 campaign of Theirworld. The Theirworld campaign is calling on world leaders at the upcoming G20 conference in Hamburg, Germany to commit to a dramatic increase in pre-primary educational funding. Legendary news host Greta Van Susteren has parted ways with cable news channel MSNBC. According to Vanity Fair, Van Susteren will not be on the air Thursday; instead the time slot will be hosted by Ari Melber. 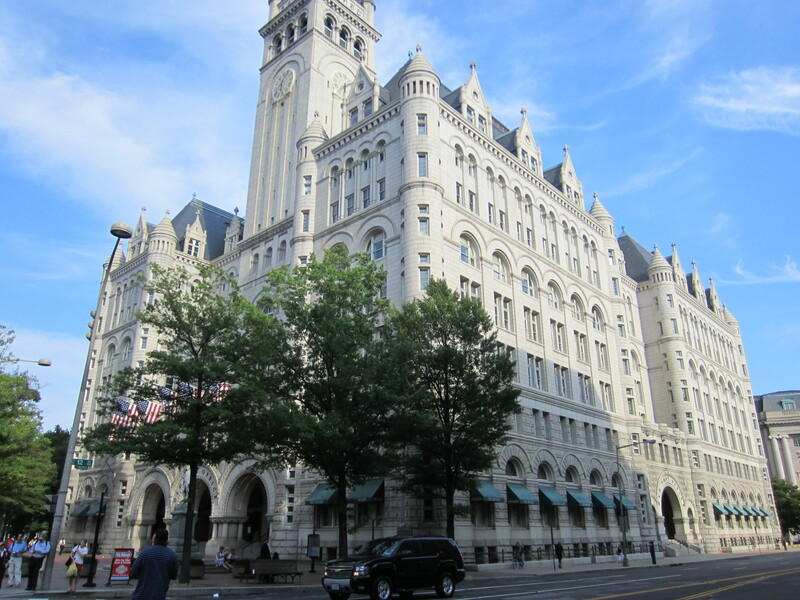 Old Post Office Pavilion in Washington, D.C. in 2012, the site of the Trump Hotel. Photo courtesy of Wikipedia. Only hours of announcing the media would be permitted to cover President Donald Trump’s first fundraiser for his re-election campaign in 2020, the White House reversed itself and closed the event to the media. The event was originally listed as closed press, but Sanders announced after inquiries from reporters that a small press pool would be allowed to cover the President’s remarks. 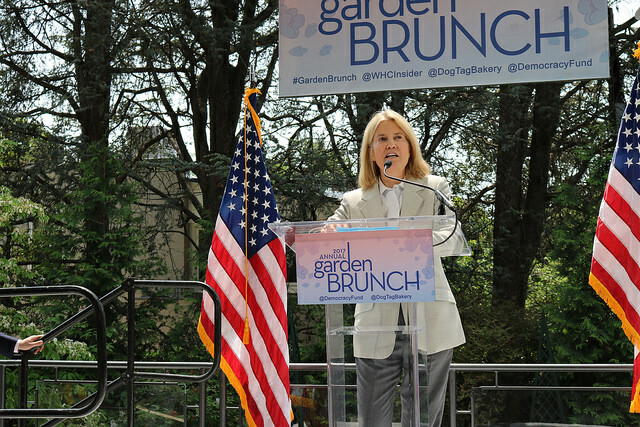 Within two hours, the event was again closed to press. There was no explanation from the White House on the reversal, nor an explanation of what logistical challenges were present in hosting the media. Former President Barack Obama had allowed members of the media to cover his remarks during fundraisers for himself or other candidates, although cameras were generally banned. In some cases, Obama would hold fundraising events entirely off limits to the press. In those situations, he was not delivering formal remarks, but instead taking questions from donors. These discussions with donors were always closed to reporters. Former President George W. Bush also allowed the media to cover portions of his first re-election fundraiser. House Oversight Committee Chairman Jason Chaffetz will join Fox News as a contributor after resigning from Congress at the end of this month, the news network announced today in a release. 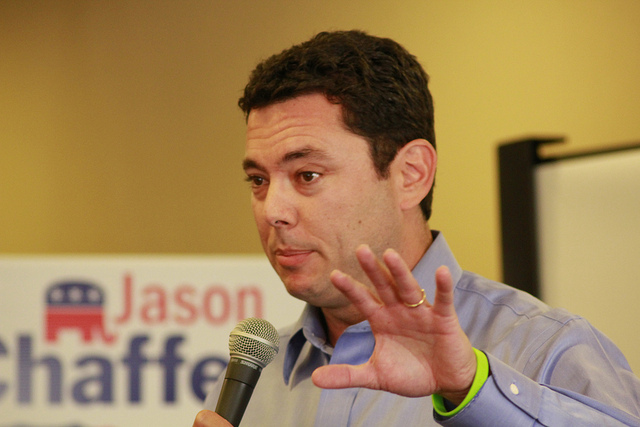 “FOX News Channel has signed soon-to-be former Congressman Jason Chaffetz (R-Utah) to a contributor role. In this role he will offer political analysis across FNC and FOX Business Network’s (FBN) daytime and primetime programming. He will begin on July 1st,” Fox News said in a press release. Chaffetz’s first day at Fox News will be July 1, one day after stepping down from his job in Congress. Possibly originating from an undercover conservative sting video that captured a recording of a CNN health news producer criticizing his network’s political coverage of the Russian involvement in the 2016 election as “bull—t”, Trump accused the network of falling ratings. Nielsen has reported CNN viewership has increased 10 percent year-over-year, according to ratings from the second quarter released on Tuesday. 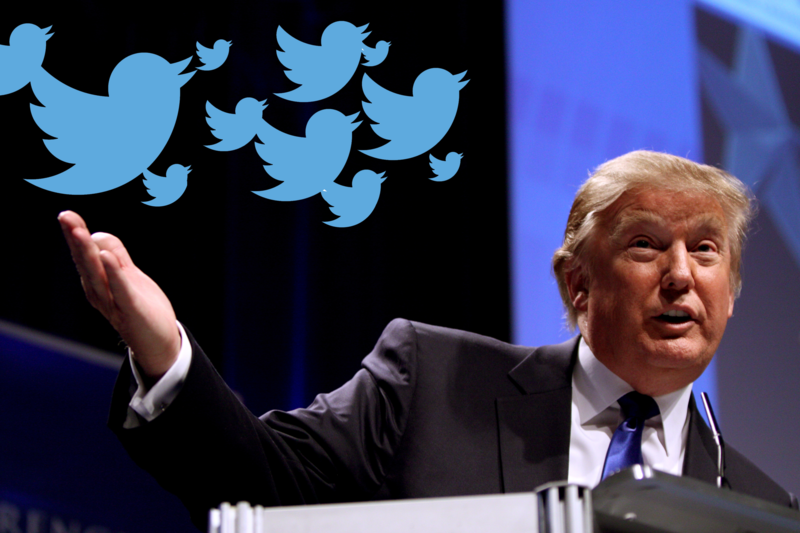 President Trump continued tweeting on this topic to criticize other media outlets such as NBC, ABC, Washington Post and the New York Times. The New York Times reported total revenue of $399 million for the first quarter of 2017, up 5 percent from the same period in 2016. Its net income was about $13 million, compared with a net loss of roughly $14 million in the same period the year prior. 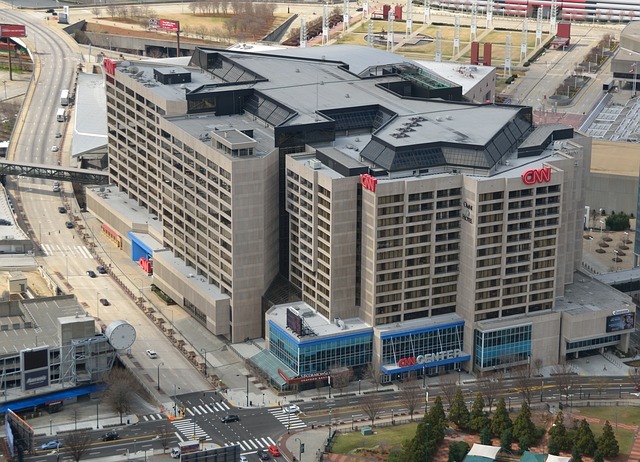 CNN Headquarters in Atlanta. Photo courtesy Pixabay. She also encouraged Americans to watch an undercover sting video produced by conservative James O’Keefe of Project Veritas that showed a CNN health unit producer questioning his network’s coverage of President Trump and Russia, suggesting other important stories have been buried by the news network. Turning to the conservative video she promoted during the press hearing, Sanders admitted its accuracy was questionable. “There’s a video circulating now, whether it’s accurate or not I don’t know, but I would encourage everyone in this room and frankly, everyone across the country, to take a look at it,” she stated. CNN viewership has increased 10 percent year-over-year, according to Nielsen ratings from the second quarter released on Tuesday. The network is running in third place in the battle for cable news viewers, behind Fox News and MSNBC, while still ranking in the top ten cable channels overall. “CNN just posted it’s most-watched second quarter in history,” the network’s communications department tweeted Tuesday in response to criticism from President Trump. 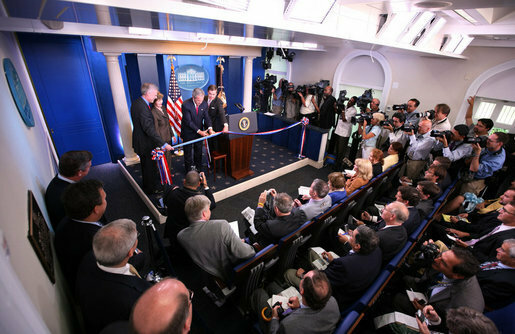 James S. Brady Press Briefing Room. Photo courtesy White House. Jeff Mason, president of the White House Correspondents’ Association, has announced the organization is “not satisfied” with the halt of daily, televised and recorded White House press briefings. The White House press team has frequently cancelled or modified daily briefings, such as hosting off-camera sessions, forbidding the use of audio from the briefings, or cancelling them all together on certain days. “The WHCA’s position on this issue is clear: we believe strongly that Americans should be able to watch and listen to senior government officials face questions from an independent news media, in keeping with the principles of the First Amendment and the need for transparency at the highest levels of government,” Mason said in an email to members of the association. Members of the White House staff have publicly suggested changes in the daily briefings, and have already changed several aspects from the traditional setting. Changes such as “Skype Seats” where reporters and talk show hosts from across the country are able to ask questions, have been included in some briefings. Photo courtesy Pavlofox / Pixabay. 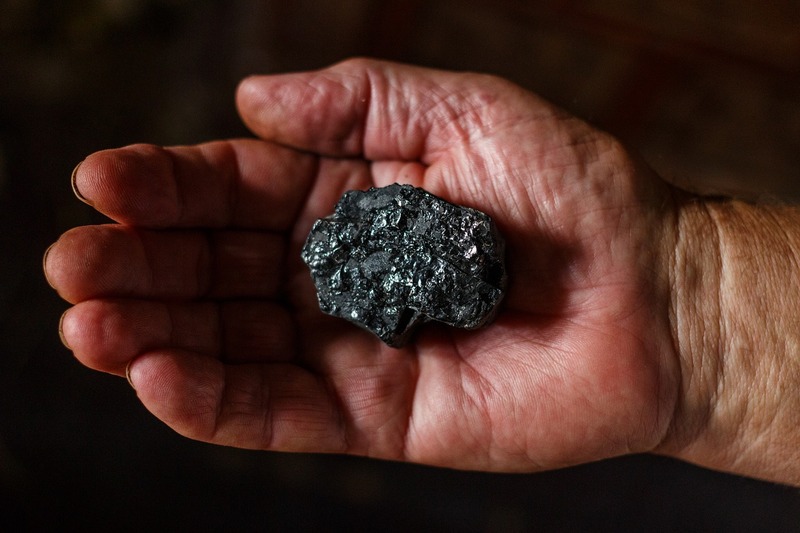 The documentary From The Ashes, a look at the lives of American communities as they struggle with the legacy of the coal industry and its future, will debut on television on the National Geographic Channel this Sunday, June 25th at 9PM EDT. Directed by Emmy-nominated filmmaker Michael Bonfiglio and produced by the Academy Award- and Emmy-winning production company RadicalMedia, From The Ashes first premiered at the 2017 Tribeca Film Festival, followed by a limited theatrical release. 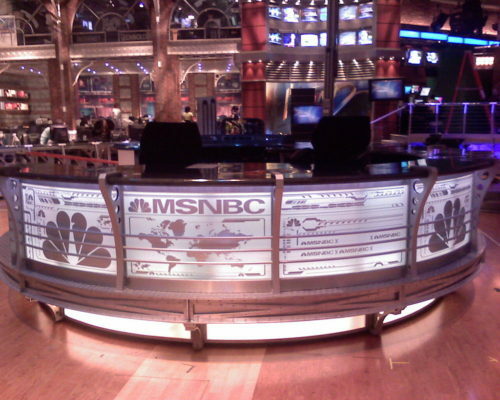 Cable news channels Fox News and MSNBC were the top two most-watched networks on basic cable for the week spanning June 12 through June 18, according to data provided by Nielsen Media Research. Fox News has spent 24 consecutive weeks as the top channel in all basic cable, reaching an average of 2.35 million viewers during prime time, and also earning total-day viewership of 1.508 million, calculated as the average of viewers between 6AM and 6PM EST. Notably, Fox News has also reclaimed the top spot in the key 25-54 demographic, averaging 460,000 viewers in prime time from rival MNSNB, which received 435,000 viewers. CNN had received 348,000 viewers in this demographic. MSNBC has lately been seeing its highest ratings in the channel’s 21-year history, with 1.942 million viewers during prime time, which landed the network at second place overall in basic cable. The channel’s total-day viewers brings the network in at third place with 1.009 million total viewers, behind Fox and Nickelodeon. CNN is also up in viewers nearly 50 percent year-over-year, and ranks seventh place in prime time total viewers with 1.028 million. The network ranks fifth in total-day viewers with an average of 831,000. All three cable news networks are up 33 percent through the first week of June, compared to the same time frame during 2016.